BBC - Yukiya Amano of the IAEA appealed to member countries for more money to fund increased inspections in Iran. The IAEA has been asked to verify that Iran is keeping to the agreement. The deal offers some relief in the sanctions on Iran in exchange for curbing uranium enrichment. The New York Times -The Obama administration intensified efforts on Thursday to counter what officials called a misimpression that the six-month nuclear agreement with Iran had opened the door to new economic opportunities with the country, emphasizing that nearly all sanctions remained in force and warning businesses not to engage in any deals still pending after the accord’s July 20 expiration. There is increasing congressional irritation with a White House so determined to clinch an agreement with Tehran’s mullahs that they are wiling to risk the broader peace. INU - Yesterday, the U.S. House Committee on Foreign Affairs examined the interim nuclear agreement that the U.S. and P5+1 reached with Iran last month. U.S. Secretary of State John Kerry was present for the meeting and helped address the Committee’s questions and concerns. The signing of the November 24, 2013 nuclear agreement in Geneva between the P5+1 and the Iranian regime is an important milestone. Analysts have been busy assessing the deal considered by some as historic, and by others as an interim step. 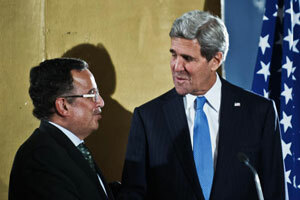 Cairo (Associated Press) - U.S. Secretary of State John Kerry on Sunday tried to reassure America's Arab friends that the United States will not allow them to be attacked "from outside," in an apparent warning to Iran.